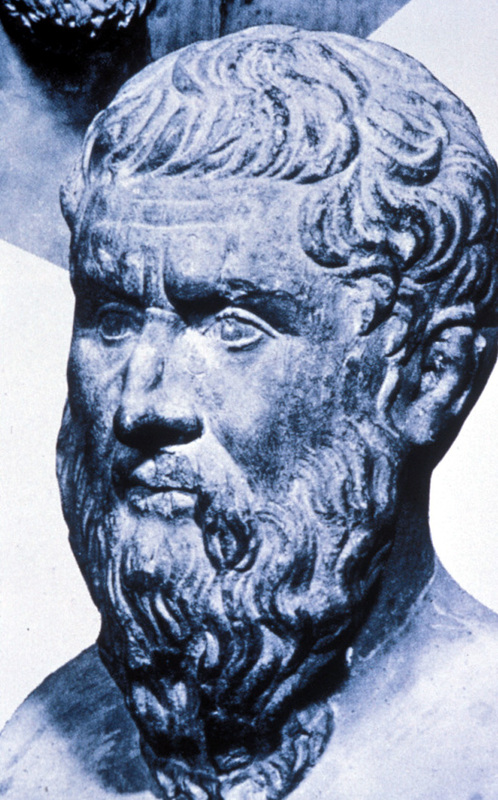 People you will read about: Herodotus 484? - 425? B.C. Greek historian. He is often called "The Father of History." Things you will read about: hieroglyphics: a form of ancient writing combining pictures and symbols. Sphinx: a statue that is half-human and half-beast. In Egypt, Herodotus found wonders hidden beneath the ground and incredible treasures behind false doors and secret staircases in man-made mountains of huge stones that rose hundreds of feet into the sky. These man-made mountains are called pyramids. 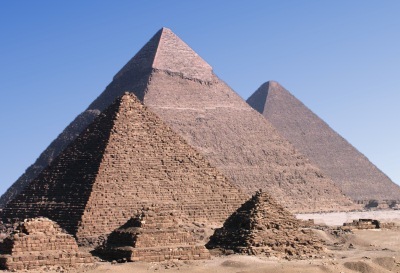 When Herodotus was in Egypt, the pyramids were used as ancient monuments to dead kings. At the base, the pyramids have four exact sides of the same dimension. The tremendous walls rise with precision to form a point and make a perfect triangle. It is the precise dimensions of these enormous stones that. astound people today. Hundreds of these pyramids were built, but there are only 35 that are still standing along the Nile River. These magnificent structures were built at the time of a great flood to give the farmers work, since they could not care for their fields. The Egyptians, as well as being interested in architecture, were also interested in astronomy. They discovered that when the great star Sirius came into view, the river would rise and the fields would become flooded. A dark hall in the top of one of these pyramids was used as an observatory to locate this star. By recording its annual appearance, the Egyptians were able to create a twelve month calendar. The Egyptians also placed the north wall of another pyramid at such an angle so that at spring and again at autumn, one half of this exterior wall was in the shade, and the other half was in the sunlight for two weeks to show the change in the seasons. We know the pyramids were more than observatories to study the stars. They were used as burial places to protect the coffins of kings. Herodotus described a burial chamber in one of the pyramids as being an island surrounded by a lake, the coffin on top of this island. Throughout history, men have searched for these chambers which were the homes of the kings for eternity. The Egyptians believed that after death, a person began a long journey and a whole new life. All of the wealth that a king owned was stored in the chamber along with food and weapons for his trip. On the walls there were paintings which told of the king's life. These paintings were forms of ancient writing, a combination of pictures and symbols, called hieroglyphics. The chambers were prepared by priests. These men were very powerful because it was thought that they had divine knowledge which ordinary people did not have. 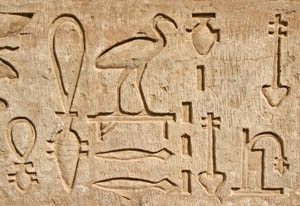 The picture characters of Egyptian writing were a mystery to modern man. No one could decipher the writing until one day a student of Egyptian culture found a polished black stone while digging in the desert. On the stone he found a story carved in three different languages. One of these languages was Greek. That gave the first precise clue to the mysterious language of the Egyptians. After a while, another stone was found and again the ancient text was translated according to the Greek. With these stones, two ancient alphabets were discovered and the riddle was solved. It was the Greek writing on the first stone that made it famous and it was named the Rosetta Stone to honor the place where it was found. In his travels, Herodotus came upon a miraculous river called the Nile that divided the hot, dry land of Egypt into two sections. Its waters were clear blue and he could see life in it. On the plains he saw the magnificent sphinxes, which were the remains of gigantic, ancient statues that were crumbled and worn by the winds of time. The sphinxes were half-human, half-beast, imaginary creatures, erected as altars to ancient kings and gods, but many still stood - monstrous, divine giants. It had been reported that long ago one of these sphinxes spoke each morning, and people would gather at its feet to listen to the great god. Some said the sound was like music. We believe the sound was caused by the heat of the rising sun on cool stone. We will never know for certain, because a great king commanded the repair of an exterior part of the statue's head and it never spoke again. Herodotus, in writing his histories, gathered many of his tales from strangers. We know that he was a scholar because he tells of things he had read. He tells us that Egyptian girls could not marry Greek boys. The reason, he said, was because the Greeks ate beef and the bull was considered sacred by the Egyptians. Many of these customs seem incredible but the Egyptians did consider the bull to be a god. When one of these creatures died the carcass was buried with the horns above the ground to mark the place. Each year the remaining bones of these carcasses were gathered and taken to a sacred place. The bull was not the only animal that the Egyptians worshipped. 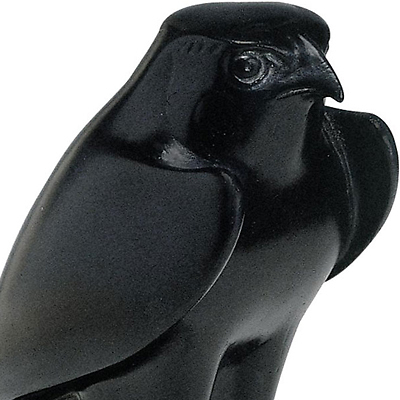 They considered many animals divine, especially the hawk, which was also a symbol of the royal family. For killing one of these birds the punishment was death. The Egyptians had so many gods that Herodotus believed them to be very religious people. All Egyptians, however, did not worship the same gods. Different beliefs were held in various parts of the country. For example, the crocodile was regarded in different ways. In some parts of the country it was held sacred. It was fed treats and wore bracelets of gold. In other parts of the country, it was considered to be an enemy and was hunted. The Egyptians knew that these creatures were almost blind in water, but had keen sight on land. They also thought the crocodile to be fond of pig. A piece of the pig was put on a strong hook and dangled in the river, while on the shore, a man would hold a pig and make it squeal. The crocodile would start off toward the sound only to find the pig in the water and gobble it down. The man would then pull the crocodile ashore and plaster its eyes with mud to capture it. 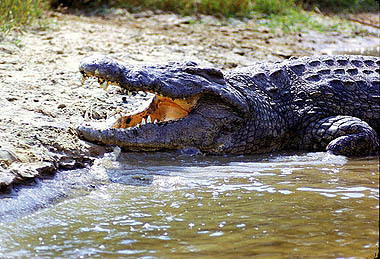 The Nile River, where the crocodiles live, is the longest river in the world and perhaps the most dangerous. 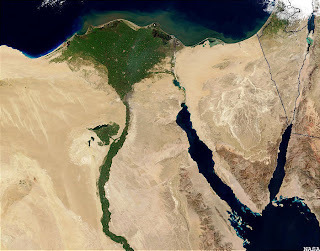 Because of the limited rainfall in the desert, the Egyptians depended entirely upon this river for their water and its annual deluge for their crops. Each year this powerful river flooded the land between the months of July and October. The cities became like islands and the men would sail back and forth in their boats. The deluge from the river brought fertile mud that made the fields rich for the farmers when the water finally returned to its banks at the river. That is why Egypt is sometimes called 'The Gift of the Nile'. 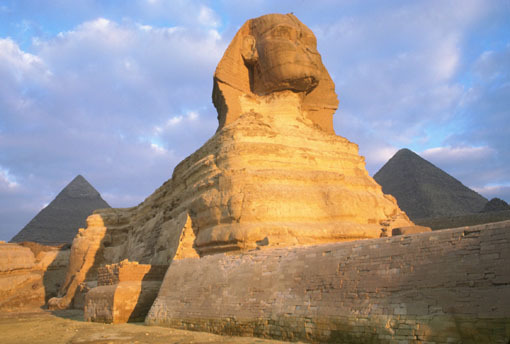 The wonders of Egypt, both natural and man-made, are certainly good reasons for calling it 'The Gift of the Nile'. But when you consider how much Egyptian history had been deciphered and made known because of the works of people like Herodotus, we must be equally grateful for 'The Gift of the Greeks'. a. The pyramids were burial grounds for kings. b. The pyramids were used as observatories. c. The pyramids helped in determining the seasons. d. The pyramids were vacation paradises. a. they thought the king's food was sacred. b. they made excellent hiding places. c. they believed in life after death. d. they would not give away the king's belongings. a. "Myths and Legends of the Far East." b. "A Biography of Herodotus." c. "Mythical Beasts and Gods." a. was a life force of the ancient Egyptians. b. caused more problems than it was worth. c. was considered an enemy to the Egyptians. d. was peaceful and quiet. b. responsible for very few contributions. c. very observant and resourceful people. a. they would blind the creature with mud. b. someone on shore would make a pig squeal. c. they would sing songs about the Nile. d. they would hide until the crocodile appeared. a. able to speak all the time. b. huge statues of unreal creatures. c. torn down by angry kings. d. still perfect when Herodotus saw them. d. "The Mysteries of Ancient Egypt." b. the achievements and customs of the ancient Egyptians. c. the crocodile as an Egyptian god. See also "The Golden Pharoah" from Edcon Publishing about the young king, Tutenkhamun, and the discovery of his tomb. And, "Exploring the Nile River" from Voice of America. One more link! "The Treasures of Cairo" from Voice of America.